Has 'peak oil' gone the way of the Flat Earth Society? The theory was straightforward and seemed to hold with common sense: One day soon, the Earth would hit its halfway point of global oil production -- its "peak" -- and thereafter, it would see a steady decline. Those behind the concept called it "peak oil." The theorists wrote books and rose high in academic departments. One of them, M. King Hubbert, had a famous bell curve named after him and discovered disciples willing to follow. They found themselves at the vanguard of a movement that essentially said, "Oil is finite, so pay attention!" Along with the celebrity came a good deal of political clout. More than one energy insider, including several in Congress, deployed the theory to argue for the end of the fossil-fuel century and the beginning of a cleaner renewable dawn -- both to cope with carbon emissions said to warm the planet and to avert economic disaster for oil-addicted societies. The original "peak oil" bell curve. Image courtesy of Cornell University. It was a good time to be a peak-oil adventurer. It was the last quarter of the 20th century, and the world, ever reliant on Middle East reserves, was nearing its oil halftime show any day, they said. In lectures, talks and congressional hearings, the peak oilers insisted the denouement would start anytime, be it 1989 or 1997 or 2005, bringing with it dangerous crude prices and economic collapse unless a substitute was brought to market posthaste. There's one big problem: Those behind the theory appear to have been dead wrong, at least in terms of when the peak would hit, having not anticipated the rapid shift in technology that led to exploding oil and natural gas production in new plays and areas long since dismissed as dried up. A much-quoted study released by Harvard University's Kennedy School last summer tells a tale that directly counters the peak-oil concept. According to Harvard, the current decade is likely to witness the most significant worldwide oil production increase since the 1980s. "Contrary to what most people believe, oil supply capacity is growing worldwide at such an unprecedented level that it might outpace consumption," wrote lead author Leonardo Maugeri, a Harvard fellow and Italian oil executive. "This could lead to a glut of production and a steep dip in oil prices." Subsequent reports and studies have corroborated that view. The Energy Department says 2013 will post a record surge in U.S. oil production, while a recent analysis by Boston Company Asset Management LLC said "structural shifts" in energy industries combined with lower demand in the West now mean the industry is poised to keep climbing, even as the thirst for crude continues to soar in China and other developing nations. "Thus, we bid farewell to the days of peak oil," Boston Co. said in the recent study (EnergyWire, March 1). When asked whether the trend is really that clear-cut, a slate of experts from universities and think tanks agreed: The peak-oil concept is increasingly out of date less than a decade after its proponents said global output would surely hit the halfway mark. And few of these sources came from what one would think of as traditionally right-leaning or "pro-energy" institutions. "There is little reason to believe that the peak in global oil production will be reached anytime soon," said Jason Bordoff, the director of the Center on Global Energy Policy at Columbia University and a former White House climate aide to President Obama. Hindsight, of course, may be 20-20, but Michael Ross, a political scientist at University of California, Los Angeles, and author of "The Oil Curse: How Petroleum Wealth Shapes the Development of Nations," says it was a faulty theory to begin with. He pointed out that many of the countries from which oil and gas companies have historically steered clear -- in Africa and Latin America -- are now expected to become significant oil and gas producers, shaking up the landscape and adding a layer of cushion atop this elusive entity called global supply. Peak oil advocates, he said, were doomed from the start because they refused to take into account technological shifts that might come about due to dwindling supplies from old fields and sustained high prices for crude. They may have also overstated the likelihood that humanity would keep on consuming that particular energy product until it was exhausted -- though that part of the puzzle remains to be determined. "I don't think it was ever a well-founded theory," Ross said. "The fact is these resources have always been out there, and it's just a matter of the industry needing to invest more in extraction technology in order to get at that. That's what we're seeing now." Ralph Cavanagh, a senior attorney at the Natural Resources Defense Council, concurred with this view. "I never thought it was a very plausible way to talk about global oil or natural gas supply," he said. Bordoff explained further, hinting that the concept may have made more sense 20 years ago than it does today, given what petroleum engineers and geologists were seeing on the ground. "But this is how markets have always worked," he said. "The stagnant production levels of the mid-2000s that intensified worries about peak oil combined with rising demand to push up prices, which stimulated people to develop ingenious new ways to tap previously inaccessible and uneconomic sources of oil -- from shale, oil sands and 'presalt' ultra-deepwater." Bordoff added that even as production and consumption have gone up globally, so, too, has the global stock of accessible oil. He noted that oil consumption has increased from 70 million barrels per day in 1995 to 90 million today, as proved or recoverable reserves increased from 1 trillion to 1.7 trillion barrels. "It's seen better days," the Brookings Institution's Charles Ebinger said of peak oil. "But I still go to conferences where I occasionally hear people arguing it." If experts' best guess is correct, humanity has consumed about 1 trillion barrels of oil to date. Peak oil advocates once thought the endpoint would be around 2 trillion barrels, but many in the industry and analysts who watch it closely have started becoming comfortable with the notion that the finish line could be closer to 3.5 trillion or 4 trillion barrels, even if that product is harder to get to and therefore more expensive to drill. If they're right, that means we're still pretty far from Act 3 of oil's five-act play. But where are the peak oilers to rebut these claims? The answer is that many appear to have vanished, fallen off the map or shifted their views, or just don't want to talk about it. Over the last several weeks, EnergyWire has been trying to get in touch with lead peak oilers -- by phone and email -- to no avail. The key figures behind the theory have either passed away, including Hubbert and investment banker Matthew Simmons, or are plain unwilling to defend their story. Several peak oil founding figures were contacted for this article. They either didn't return calls or emails or were followed into a maze of shut-down websites and disconnected phone numbers. These include former Princeton University professor Ken Deffeyes, famed British geologist Colin Campbell, French petroleum engineer Jean Laherrere, author Mike Ruppert, Swedish physicist Kjell Aleklett and Boston University professor Cutler Cleveland. Others who still hold to the theory did respond, though they tend to lack the expertise of that first generation of peak oil or have redrafted their angle to favor more technical interpretations in light of new developments. One such source is Ron Swenson, who publishes a website called "Ecotopia" from Santa Cruz, Calif. Swenson promised access to some or all of the experts listed above, as well as documents that would prove peak oil is still viable, but then he never followed through. The part of Swenson's site that deals with peak oil is called "The Coming Oil Crisis." It serves as a kind of clearinghouse for those in the founding generation of peak oil and promotes links to their works. The links appear to end around 2007, but Swenson says that is beside the point. "Current trends" evident in 1974 have given way to the emergence of more efficient vehicles and the shift to natural gas, which may lead to an electrification of transportation, not to mention the last decade's technological explosion in shale exploration. So Swenson argued that the theory is still viable, even if the peak itself has slid well past 1995 or even the revamped estimate from Deffeyes. "It's kind of like the last gasp," he said of the current production rise. "It's a little blip for two or three more years at the most, and probably not that long." When asked whether he was qualified to make that statement, Swenson noted that he had graduated from Stanford University -- an institution that has determined that oil supplies are now on the rise and not likely to crest any summits anytime soon. When informed of that, Swenson lumped Stanford into the same boat as Harvard or the Massachusetts Institute of Technology, claiming academics there have been paid off by energy corporations. "They're building this sand castle," he said. "They basically don't have any facts to back up what they're saying." Among other numbers, Swenson was informed that the Congressional Research Service recently reported that the United States in 2012 pumped 6.2 million barrels of oil daily, well up from 5.1 million barrels in 2007. That's the fastest five-year production increase since the oil industry began operating in the United States back in the 19th century. Swenson said such statistics, even if true, are proof that Wall Street and oil patch states are "desperate to prove that their investments are viable" by getting as much product out of the ground as they can in the short term. A more legitimate source might be Randy Udall, whom ASPO USA cites as "a sustainable energy expert" on its site and co-founder of the group. Udall is also a brother of Sen. Mark Udall (D-Colo.). Randy Udall, in the face of criticism of peak oil, recently published an op-ed in The Christian Science Monitor in which he acknowledged that domestic U.S. oil and gas production has grown by 35 percent since 2005, but he dismissed the notion that this disproves peak oil as hyberbole. Udall argued that the United States has merely substituted poor-performing crude reserves for good ones, because, as Hubbert correctly predicted, the United States did reach its production peak in the 1970s. Even with shale exploration, the United States is not expected to rise back to its peak years, so Udall sees all the confidence about new production numbers as way overblown. "Many good wells, not to mention the dogs, will be exhausted within 15 years," he wrote in the op-ed. "The decline rate of a shale well is breathtaking, a Wile E. Coyote-like plunge from cliff top to oblivion. In the Bakken and Haynesville plays, production can fall 80 percent within 24 months. By the end of four years, your prize well is on its way to stripper-well status." Eddie Scher, of the Sierra Club's "Beyond Oil" campaign, said the argument about peak oil doesn't really matter in any event. The point, he said, is that even if oil continues to flow, the planet's atmosphere is getting closer to something that might be called its "peak carbon" carrying capacity. Scher compared the current state to the end of the Stone Age, saying, "The Stone Age didn't end for lack of stones," in a quote that was borrowed from a Saudi oil minister. "The oil industry knows we're moving toward solutions," Scher said. "They want to get it out of the ground as fast as they can before it's irrelevant." Cavanagh sided with Scher, saying the problem was that peak oil assumed humanity would blindly use as much energy as available until it dried up. He cited a recent study by the Bipartisan Policy Center that found U.S. energy efficiency has exceeded the contribution of any other energy resource. "The peak oil thesis reflects a very old view," he said. "Physical restraints were all that mattered, that we would blindly use as much energy as was available." He added: "Now we know we will stop using oil well before we run out of it. We will do that almost independently of who turns out to be right on what the actual reserves were." James Hamilton, an economist at the University of California, San Diego, offered an equally nuanced view. For one, he urged a more careful treatment of peak oil's definition before assessing whether the theory has gone by the wayside. "The whole expression has come to have all kinds of connotations," economics professor James Hamilton says of peak oil. "I think it's time to avoid it." Photo courtesy of the University of California, San Diego. "You'd want to be careful how you would define 'peak oil' before you answer that question," he said. Hamilton added that declines in production in the world's biggest oil fields -- in the North Sea, for instance -- are more important factors than many energy insiders may believe. He has a hard time accepting that tight oil formations will produce the same bounty. "Don't forget this is expensive stuff we're talking about," he said of tapping into shale formations. "It makes sense to go after it at this price, but what if oil drops to $60 a barrel? I wouldn't overplay the consequences of shale production." "The whole expression has come to have all kinds of connotations," Hamilton said. "I think it's time to avoid it." Bordoff appeared to concur. He said "vast quantities of oil remain" but pointed out that the price point will determine whether it's tapped. Beyond that, it's anybody's guess when "the peak" would occur, adding that it's probably irrelevant. "The point at which global production eventually peaks is unlikely to mean the world suddenly finds itself running out of oil, but rather that demand has started to decline, too, as people find substitutes," he said. The current director of ASPO USA, Art Berman, a petroleum geologist and energy consultant, likewise warns that prices are the most important factor when determining when gas or oil production might peak. He also draws what he calls an important distinction between reserves and resources, noting that just because reserves are high doesn't mean they are necessarily accessible. Berman cited the shale gas explosion in an analysis posted on the American Public Power Association's website in December 2012. He thinks shale's potential is overstated because too often journalists and policymakers are focused on resources, not actual reserves. "A resource is everything that is in the ground without consideration of economic value," he said. "People look at shale gas resources and say they are immense. However, the next question is, of that total volume of resource, how much can you make money on? And the answer is a much smaller percentage." "'Peak oil' does not mean we are running out of oil," petroleum geologist and energy consultant Art Berman wrote in a recent American Association of Petroleum Geologists newsletter. "It means that we have run out of the cheap oil, on which the global economy is predicated." Photo courtesy of Artberman.com. According to Berman's math, there is about eight years' worth of shale gas available in the United States -- making him one of the lead skeptics when it comes to the shale revolution. He also believes that about 80 percent of U.S. shale plays have already reached their peak and tends to dismiss government numbers on any of it, saying in the APPA post that Washington is run by "a bunch of amateurs dealing with something that needs a bunch of professionals." "I don't think that the administration or the Congress have a good understanding of energy in general," he wrote. "Frankly, I would like to hear from a lot more government representatives, because they need the information." 'Like people who predict the apocalypse' or misunderstood? Berman, who works for Labyrinth Consulting Services in Sugar Land, Texas, also took issue with the notion that peak oil theorists are increasingly quiet in the face of new production numbers. He cited ASPO USA's recent conference at the University of Texas, Austin. "Some people take us very seriously because they understand that 'peak oil' does not mean we are running out of oil," he wrote in a recent American Association of Petroleum Geologists newsletter. "It means that we have run out of the cheap oil, on which the global economy is predicated." Berman added that peak oilers "applaud the creativity and innovation" of energy industries in recent years but reiterated his belief that "very expensive oil" means $80 per barrel is the price point at which operators can break even. He also noted that most still don't run their cars with natural gas. "The high price of oil is among the key underlying reasons the United States and most of the developed world cannot get out of this recession," he said. "Because of the high price of oil, consumption in the United States has fallen 1.5 percent per year since 2005, and GDP has followed suit. Pre-2005 normal growth for the U.S. economy was 1.8 percent per year. With an annual 1.5 percent decline built in, it is not hard to see the problem with resuming growth." Another still-active peak oiler, geoscientist Jeffrey Brown, says the problem with the macroeconomic picture on crude is it fails to break down oil into its correct subcategories. That would include pure crude oil plus crudes that consist of condensates and "petroleum liquids," or natural gas liquids. "Even if we include condensate, I estimate that global crude plus condensate production only increased from 73.8 mbpd in 2005 to about 75.5 mbpd in 2012 (a rate of increase of only 0.3%/year)," he wrote in an email. He added: "Note that condensate and NGL's are derived from natural gas production, and of course biofuels are a very low net energy source. So, despite a doubling in global crude oil prices, it's a near certainty that we have not seen a material increase in actual global crude oil production, with higher prices merely serving to encourage liquid substitutes. In other words, so far, contrary to conventional wisdom, the peak oilers have been right about their concerns regarding a near term peak in crude oil production." Yet energy consultant Michael Lynch, a petroleum professional at Strategic Energy & Economic Consulting Inc., calls such talk nonsense. Lynch has long been a kind of nemesis to the peak oil crowd, which means he also knows them intimately. He said the original run of theorists has probably grown too old to respond to new realities. For instance, Campbell, the British geologist, "hasn't put anything up on his blog for about a year," Lynch said, while numerous attempts to contact Deffeyes -- probably the most vocal U.S. academic on peak oil in the 1990s and 2000s -- were unsuccessful. "I think it's partly that peak oil is yesterday's news," he said. "People get tired of it." 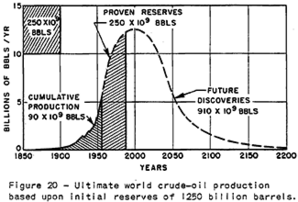 Lynch added that peak oil, as he saw it, was always "very bad mathematically" because its proponents focused on geology as they saw it through that era's engineering capability and not market dynamics or how high prices held there for an extended period might affect energy companies' exploration savvy. "It's a little bit like people who predict the apocalypse," he said. "The theory is good, but it's subject to all kinds of mathematical errors." At Princeton, attempts to get comments from professors in Deffeyes' old stomping ground at the Department of Geosciences led to more frustration. Email exchanges with a half-dozen or so current professors bore no fruit on how to reach him or whether the university should distance itself from the peak oil concept, because Princeton.edu is still home to a website promoting Deffeyes' books. Allan Rubin, the department chairman, said scientists come up with theories all the time, some of which are later proved incorrect. Princeton, in his view, has no responsibility to police its own sites unless a given publication is "particularly egregious or offensive." "This is all part of what we refer to as 'academic freedom': Our employer (Princeton University) is not continually looking over our shoulder to see if what we are writing conforms to some standards established by others," Rubin wrote in an email. "They make a decision whether or not to hire us, and later whether or not to grant us tenure, based upon our publication record up to that time. Of course this system has strengths as well as possible weaknesses." Rubin would not comment on peak oil itself, saying he lacked the expertise in that particular field. Other responses from Princeton academics mirrored Rubin's. Ross, a fellow academic at UCLA, took issue with that view and said someone affiliated with the first wave of theorists should step up. "It's a hallmark of academic integrity that, when the facts contradict your hypothesis, that you admit you were wrong," he said. "Scholars make wrong predictions all the time, and those who are good scientists admit it when their predictions turn out to be inaccurate."